Writer Jason Latour (SOUTHERN BASTARDS, Spider-Gwen), artist Chris Brunner (SOUTHERN BASTARDS, Batman: Legends of the Dark Knight), and colorist Rico Renzi (Spider-Gwen, Squirrel Girl) will release a trade paperback collection of their miniseries LOOSE ENDS this July. No one seemed to notice Sonny Gibson as he stepped back into The Hideaway, a dusty little honky-tonk nestled off the Carolina highway. But before the night was over, Sonny would be on the run—from the law, from criminals, and even from himself. LOOSE ENDS is a gritty, slow-cooked, Southern crime romance that follows a winding trail down Tobacco Road, through the war-torn streets of Baghdad, and into the bright lights and bloody gutters of South Florida. LOOSE ENDS TP (Diamond code: APR170742, ISBN: 978-1-5343-0215-0) hits comic book stores Wednesday, July 5th and bookstores Tuesday, July 11th. The final order cutoff deadline for comics retailers is Monday, June 5th. 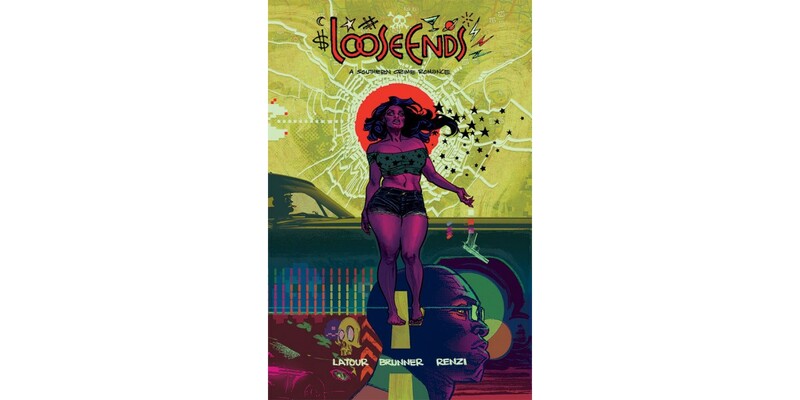 LOOSE ENDS TP is available for preorder via Amazon, Barnes & Noble, Indiebound, and Indigo.